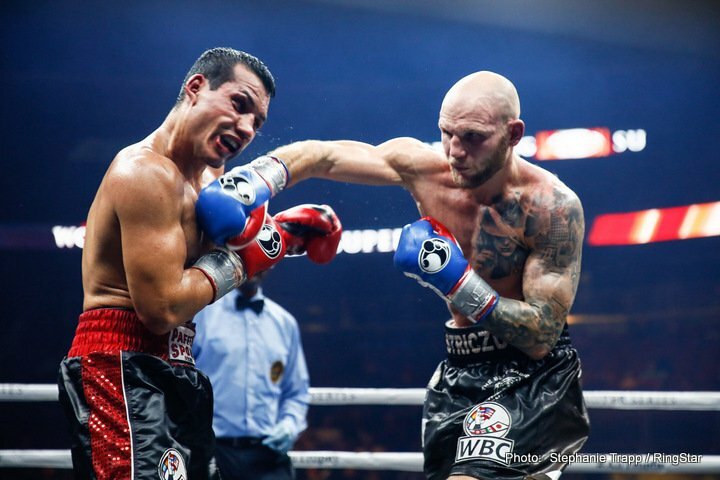 By Scott Gilfoid: Maciej Sulecki says he’ll be healed in time to fight WBO middleweight champion Demetrius Andrade in June despite having a hand injury that promoter Eddie Hearn says will keep him out of the fight. Sulecki (28-1, 11 kOs) believes his injured hand will be fit enough for him to return to the ring to take on the unbeaten Andrade (27-0, 17 KOs) for his next title defense on June 22 or 29 in his hometown of Providence, Rhode Island. The way that Andrade’s promoter Eddie Hearn of Matchroom Boxing is in such a hurry to move rule out Sulecki fighting Andrade in June, it gives the impression that he wants to move in a weaker opponent in his place that won’t be a threat to beating him. Sulecki is a SERIOUS threat to Andrade. That’s a fight that Demetrius could very well lose. It’s interesting how Hearn is chomping at the bit to say that Sulecki is injured. Sulecki sounds like he was surprised at Hearn making this move by ruling out for the fight. The original idea was the winner of the Sulecki vs. Gabriel Rosado fight would face Andrade for his WBO title in his next fight. Sulecki looked outstanding in beating Rosado by a 10 round unanimous decision last month on March 15 at the Liacouras Center, Philadelphia, Pennsylvania. Hearn doesn’t have to match Sulecki against Andrade, because he’s not the WBO mandatory. It was Hearn that wanted the winner of the Rosado vs. Sulecki fight to face Andrade. Was Hearn hoping that Rosado would win? Andrade vs. Rosado would play out big in the United States. Rosado is well known on the East Coast, and a lot of American boxing fans are familiar with him. Sulecki is less well known with the U.S fans, and a fight between him and Andrade would receive less attention. Sulecki is also more of a threat to beating Andrade than the older 33-year-old Rosado (24-12-1, 14 KOs). If Hearn was hoping that Rosado would win that fight, then Sulecki ruined his big plans. Hearn is now quickly ruling out Sulecki as an opponent for Andrade without giving him time to let his hand heal. There’s still over two months to go before Andrade’s next fight on June 22 or 29. Sulecki’s hand might heal by that time for him to take the fight with Andrade. Ultimately it’s going to be up to Hearn whether he wants to let the fight go ahead of not with the 29-year-old Sulecki. With the way that Andrade has been matched lately by Hearn with him putting him in against weak opponents in Artur Akavov and Walter Kautondokwa, it would be nice if he broken that trend by matching him against a fighter with talent for a change like Sulecki. Even if there’s a chance that the fight might need to be postponed if Sulecki’s had problem persists into training camp, it’s still a far better option having him than Hearn dragging out another unknown fighter with limited talent for Andrade to fight. For the sake of the DAZN subsribers, who pay each month to see quality fights, Hearn needs to make a dramatic upgrade in the kind of opposition he’s matching Andrade against. Sulecki would be a good opponent for Andrade if he’s confident that his hand will be healed in time for him to fight by June 22 or 29. Andrade already beat Culcay and Fox, so those two are unlikely to get the fight with him in June. Jeff Horn is with Top Rank, which makes him unlikely to face Andrade. Lemieux is with Golden Boy, but plans on fighting on the Saul Canelo Alvarez vs. Danny Jacobs card on May 4. Liam Williams is with a rival promoter in the UK, which him unlikely for Andrade. Hearn probably won’t use Williams. Out of all those guys, Culcay stands out, because he’s someone that is respected, highly ranked, and he had good amateur career. However, Andrade already beat Culcay by a 12 round split decision two years ago in March 2017 in Germany. There’s no point in them fighting again. If Hearn still insists on using Culcay as Andrade’ opponent, which is likely, he’ll make the most with the belief that the casual boxing fans won’t have heard of the results of the Andrade vs. Culcay fight from two years ago, so they won’t be turned off by seeing a retread fight.